SportsCover™ Bike Shield is probably the best bike cover to protect the frame against flying stones and gravel. 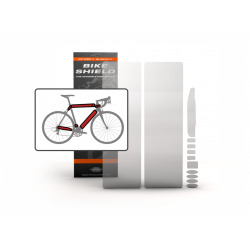 The invisible ramskyddet is transparent and stötreducerande like no other - easy to shape and apply without heat and water is just one of many features Bike Shield provides for maintaining the value of your bike. SportsCover Bikeshield There are 12 products. 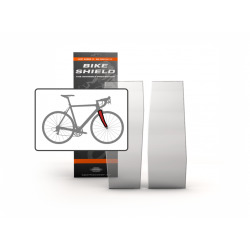 Bikeshield upper Tube small 50x5cm SportsCover SportsCover™ Bike Shield is probably the best bike cover to protect the frame against flying stones and gravel. 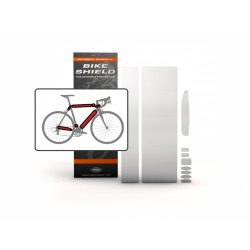 Bikeshield Tube Large SportsCover SportsCover™ Bike Shield is probably the best bike cover to protect the frame against flying stones and gravel. Bikeshield Stay & Head shield SportsCover SportsCover™ Bike Shield is probably the best bike cover to protect the frame against flying stones and gravel. Bikeshield seat Tube medium 50x10cm SportsCover SportsCover™ Bike Shield is probably the best bike cover to protect the frame against flying stones and gravel. Bikeshield Halfpack SportsCover SportsCover™ Bike Shield is probably the best bike cover to protect the frame against flying stones and gravel. Bikeshield Fullpack Regular SportsCover™ Bike Shield is probably the best bike cover to protect the frame against flying stones and gravel. Bikeshield Fullpack oversized SportsCover™ Bike Shield is probably the best bike cover to protect the frame against flying stones and gravel. Bikeshield Fork shield 28x9cm SportsCover SportsCover™ Bike Shield is probably the best bike cover to protect the frame against flying stones and gravel. 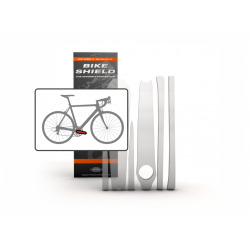 Bikeshield Crank shield SportsCover SportsCover™ Bike Shield is probably the best bike cover to protect the frame against flying stones and gravel. Bikeshield Bikeshield Chain Stay Shield SportsCover SportsCover™ Bike Shield is probably the best bike cover to protect the frame against flying stones and gravel. Bikeshield Chain Stay Shield 3 pcs SportsCover SportsCover™ Bike Shield is probably the best bike cover to protect the frame against flying stones and gravel.